I am a 55 year old male. For the past 3 years or so I have been dealing with posterior tibial tendon dysfunction that has really gotten bad in the past couple of months. An MRI just performed showed rupture of the tibial tendon right near the ankle bone (Achilles tendon looked perfect). I'm wondering if this could be related to Levaquin, although I took the Levaquin sometime in 2006 (so about 7 years before symptoms appeared). At this point, Dr is recommending orthotics and physical therapy. He also was not very positive on the future, I think just hoping to gain back some functionality or stabilize at least. My history. I have always been flat footed and ran for probably 30 years (stopped 3 years ago). In addition to the PTTD, I also strained tendons in my left wrist in July of 2015 when trying to remove an oil filter on the car. The wrist still is not right. Xrays showed no damage. In 2010 I had heart surgery to repair my mitral valve. I was told that two of the "tendons" that hold the valve in place were gone or ruptured and that the condition was congenital. Having read the posts on Levaquin, I am wondering if any of this could be related. I was on a 30 day regimen of Levaquin in 2006. I also had a 10 day script of Cipro probably 15-20 years ago. Questions: would a Levaquin injury show up so many years later? Would the program to heal tendons be sufficient or is a Levaquin detox also in order? Which tendon healing program should I follow. The overall answer to your question is, 'yes, Levaquin can cause problems/damage years later'. B. Levaquin can/does damage the mitochondrial (power plant of the cell) population in your connective tissue (thus cells die and tendons etc get weak/fall apart). 1. So yes, the tib tendon rupture can be a direct or indirect result of that. 2. If the rupture of the mitral valve tendons is in fact congenital, then obviously the Levaquin isn't a factor. can be the cause (again, directly or indirectly). Did you have symptoms or heart murmurs before the levaquin, or any testing pre-levaquin so you could determine whether you had 'congenital' valve issues before the Levaquin? I imagine you didn't. But ultimately it doesn't matter. More on that in a bit. 3. The wrist thing is very likely the predictable result of years of running on a nutritional insufficiency. If the body doesn't have what it needs to operate optimally, it does as best it can as long as it can. But then you go to do a low-requirement task like removing an oil filter and end up with lasting write pain. That's not 'normal'. That's a sign that you have much diminished function. 4. Remember I said 'but ultimately it doesn't matter'. Whether you had mitral valve tendon rupture before Levaquin or not is an interesting mental exercise, but ultimately, you have enough clues that point to suffering from levaquin side effects, and you took A LOT of Levaquin over time, and by it's unavoidable nature Levaquin depletes the body of Magnesium. Take those three data points into the calculation, and it's clear that at the very minimum, you should consider that you ARE suffering from Levaquin side effects. Everybody is different. Some people have immediate and severe symptomology. Some people don't really feel it until years later after the body has trudged forward running on empty. There's really no such thing as a 'Levaquin Detox'. But your body is in a hole, so to speak, and it would be wise to dig yourself out of that hole. So I highly suggest getting and starting working with The Fluoroquinolone Toxicity Solution (formerly The Levaquin Tendonitis Solution)(and get on the Forum Kerri and I run to support people working with the program). One way or another, you MUST get out of the nutritional hole, or it's predictable that you'll have more and ongoing issues like the tib and the wrist and have a hard time recovering from them...as your body continues to run on empty over time. 5. As far as the posterior tib rupture: Partial tear or complete tear? Comments for Could posterior tibial tendonitis and rupture be from Levaquin taken years ago? The posterior tib tendon is a partial tear. There is thickening of the tibialis posterior tendon with split tear involving the distal most portion adjacent to the insertion site on the navicular tuberosity. A small amount of fluid is also noted within the tibialis posterior tendon sheath, in keeping with reactive tenosynovitis. There is minimal edema involving the flexor hallucis longus muscle without tendinosis or tear. Flexor digitorum longus is within normal limits. Extensor and peroneal tendons are unremarkable. Anterior talofibular ligament (ATFL) is torn. There is diffuse signal heterogeneity with loss of normal architecture in the posterior talofibular ligament (PTFL), in keeping with high-grade sprain versus tear. 1. Tibialis posterior tendinosis with split tear adjacent to the insertion. No significant tendon retraction. 2. Minimal flexor hallucis longus muscle edema without tendinosis or tear. 3. Torn ATFL with high-grade sprain versus tear of the PTFL. 4. Posterior subtalar joint effusion with mild synovitis. Ok, so that's not awesome. Split tear (which I understand to mean it's a tear parallel in the length of the tendon) near the insertion and a tear in a ligament and almost-a-tear in another. And some other milder stuff. A. muscle function isn't great, muscle thusly isn't aborbing force and that force is transferring to were the tears etc are. B. possibly the tears are from fluoroquinolone antibiotic use...but chances are this is indirect. Meaning, years ago you took Levaquin, it depleted/reduced magnesium in your body, you went about your life with not enough magnesium, which had you muscles get and stay too tight and thus not absorb force and thus the tears etc have developed over time and too much force applied to them. Can you make a recommendation on which tendon repair program to follow? The one for Achilles tendon? Yes, I'd go with Reversing Achilles Tendonitis. 1. -Probably- you're only suffering from the nutritional depletion side effects of Levaquin, and not the mitochondrial population kill off (maybe a little of that) and not the DNA damage to connective tissue. 2. The location(s) of your damage points to the nutritional insufficiency helping a downward spiral of decreasing muscle function (in all the lower leg) which led to muscles not absorbing force and that force going to those little ligaments and the post tib tendon. 4. The Reversing Achilles Tendonitis program covers the nutrition I'd advise for your scenario. It covers the physical/manual self care concept for the entire lower leg (less focus on specific strucutres, more focus on finding everything problematic and making it better, regardless of the name of the structure). You're going to make your entire lower leg ecology work better, which will lower pain levels and increase function levels. Both of those are required to heal that tendon with the split in it. And the torn ligaments, if they're complete tears you're probably out of luck and it's a matter of getting everything working as well as possible so even though they remain torn/separated it will cause little to no problem (that's the goal and depending on your scenario, is at least close to doable). This group of disorders is often dismissed and overlooked. I totally agree that EDS is often dismissed and overlooked. I would add for the Fluoroquinolone context that people with no problems can suddenly (or soon after) have serious and significant problems. EDS usually has clues and a predictable progression. 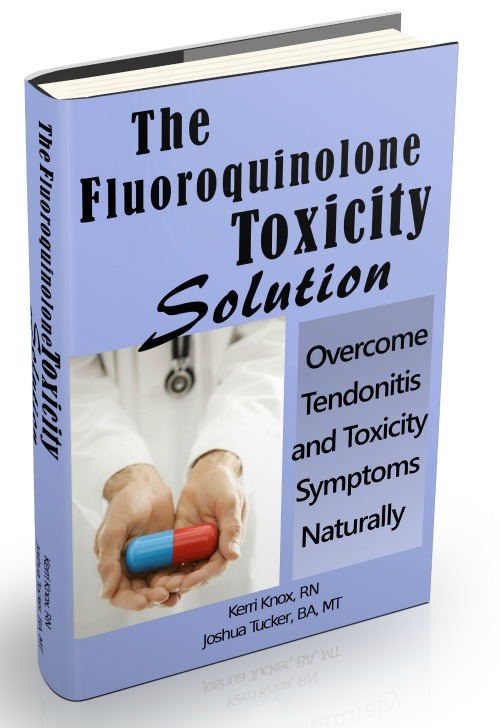 Fluoroquinolone sufferers generally go from fine to very much not fine.